.............................................European political prisoner & King in partial Exile..
Our document is an invitation for every business, research, scientific, industrial, development companies on the planet Earth or foreign. The letter is an invitation to establish cooperation and the establishment of a new civilization forms of cooperation and new meaning of The Humanity. Dear traders, owners and representatives of business corporations, representatives of the institutions and other legal groups, Dear researchers, scientists, engineers, doctors, industrialists, builders, experts and developers, people from around the world. My interest is to pass for you my invitation for cooperation in order to the development of new civilization on our planet Earth and in the universe. Invitation ktera is intended to start the global cooperation to create the largest forms of Technology object which zsájmu our cooperation will achieve dimension of special territory on our planet Earth and the same time in the Universe, an area of over several Galaxy and soon Super group Galaxy. Invitation to create a common step to overtake the value of human and the same time all the value of civilization on our planet Earth. Technological civilization on the way of intelligent super city of the major technologies that overtake the value of human knowledge or maximum dimension and intelligence. Common step which we can call as a new Genesis. Together The Technological City which is commonly significant and valuable, shared city that is created on our cooperation and development, great benefits and a lot of new possibilities for development. Our cooperation that allows us create many new possibilities and step's who can outstrip all values of The Mankind. The city is founded for International cooperation and raise our values. The city is designed for extending our common policy and communications, strategy and market logistics, intelligence and development of common technologies, development of common civilization, industrial zone's, laboratories, space center's, android civilization's or many option's of special character The Technological Civilization. Technological City is created for Started common steps that are today the most important steps in the history of mankind. With really characterized, so these are the steps that are among the most significant step in the history of mankind today and for future, we are camn created most important cooperation in the future human history. Steps which today we can use a lot of us people on the planet Earth, the steps that are designed for every business corporation and active group in category for technology, science and research. Technological City which is based on joint steps that lead to the unification of all companies worldwide. Companies for the development of technology, science and research, chemistry or electronics, nanotechnology and molecular science, particulate matter and energy, mathematics, space, physics and mechanics or computer, bacteria and organisms, genetical engineering, industry machine, all be database of Technology development and Technology civilization. Cities for all companies that deal with these qualities and common interest. Common International City of Technological Diamond who is intended for creation of an International Community Cooperation and development of common technologies in the form of strong and remarkable civilization which is based on common values and own scientific technology. Technologies that are important to us and useful in the early future of development for the world. The city that is created in the form of the right of associations, community associations in category of half of autonomous subject in the federation of The Imperium of Diamond's government. Community who is not a political group that is recognized by the political right heads of foreign governments, community who is created as a federation entity in the form of Association, community and with the demands on their own active interests in the territories with an area of over several galaxies. It is a legal form of the Legal Company as the national society, extended trading company under the inner system which is based on democracy, which controls the number of representatives of trading corporation's, who lead collaboration across the our Technological City as The Universal Civilization. The representative of the company, owners and other owners trading company become a Senators at a common International Chamber of The World Technological Civilization. Therefore, every Senator has the right to vote and support the development of a civilization common values. Joint development or used of civilization is based on liberal politics that we can actually determined by the agreements. Internal Busineds cooperation, everyone is entitled to their copyright and possessions. Everyone has all the rights to develop custom embedded and common property, expanding civilization and promote cooperation of all groups, cooperation that develops and expands our common property that we can create a stronger benefit and value of our common civilization. The Technological Cities function as one strong group of several trading company that recognizes The King of The country The Imperium of Diamond's or the government of the country in which the city is built. Our Technological Cities, common civilization is based on the development and research of common technologies, the development of scientific knowledge, the creation of joint laboratories, development of joint transport and industrial zones, common spaceship's and grat cosmic civilizational ship's for galaxy transport, common mining center's, android civilization's, supercomputer cities, cybernetical center's, clone center's, development system's center's, factories or sduper factories and planetarz factoried and a powerful database and computer programs for the internal logistics and managament. Super computers or the use and development of renewable sources of laboratory. Development of common technological strategy and united copyright and patent's, business right's and knowledge for the promotion of joint projects. The City is an international city which is named as ,,The International City of the Technologicasl Diamond". The city is led to widespread only High Tech and super form's of technologies. System and civilization. The first to be creating a common agreement on co-ownership and the distribution of values, agreement to ensure trust and security. Agreement on a private owned company which put privacy property and consequently recognition of the common property which was jointly produced in our Common Technological Civilization. Together producing assets are then possesion on behalf of the international center, the whole community. Joint Association is then based an account at The Central Bank the country's government ,,The Imperium of Diamond. "The Central Bank leads Manage Account which is based only on the values of which are developed about common Technological City, not personal property of Your Company. Central bank may establish a branch in the city and issues, for example our common coin under system Dual-Inter-Value. Our International Technological City, a city which is based on a powerful civilization can be for us a new and strong values. The value the strong support of our joint strategy and policy for the commercial development companies, development of technology and market development of a common trade together and outperform the competition of foreign entities. City can be utilized for our common logistics for the market place with patents and copyright in the direction of the market, design, industry and other trade direction. The city which for your trading company creates new and powerful possibilities, greater international cooperation and increase your financial gains. It's really, every business that initiate cooperation may have a lower profit of a few new Trilion €. If we are able to create enough success, joint profits can be calculated in the values of several Quadrilion €, too in Quadriliard € as a minimal start of our Civilization. Reall value can outstrip price the Kvintilion € and more. Often, it will really values that are more important than the planet Earth. Every business has all rights to own their share part of properties of the entire city and sell it together with his own trading Firm, be special system of shared paper's. We obtain these values work together. Work which is based on the development of a common civilization. A civilization that is based only on the development of modern and High Tech, special Technologies and dynamical Intelligence. Civilization which is based on the standard of engineering and logistics intelligence, the technological arts of civilization, the use of robotics and replace a human worker, utilization of robotic technology and artificial intelligence or super computers which can overtake even thousands of scientific work groups. We're going to pool together high tech and new system the most modern technology. Immediately focus on a nanotechnology development, we constantly uses his own production zone in laboratories, who will work for us as renewable raw materials. Labs that can produce metal ore, diamonds, crystals, gases and liquids, many other substances of raw material and organisms, reproduce uranium and other substances. Together the town which is for indoor use based on private sources of raw materials. Gold, titanium, diamonds, silver, crystal or stone and sand, gas and energy, power generation, industrial bacteria and much more. Immediately we create research for the replication of human life and other cells, the cells and research that you may create immortal life or prolong life by hundreds of years. City in which it is created custom intra net, support for internet, 3D and 4D virtual worlds, radar site and power plants, utilities, research and development multy particles system's of large particle accelerators (Multy LHC's), energy creation and development of multi-dimensional process and energy or prostor, molecular science, Modern scientific focus, botany and genetics of plants or beasts, modification, production of special computer processors, the development of a supercomputer science for meteorology, material's, energie's, time-space and quantum mathematic's, created many kinds super computers, super tube post, transports the rate of miliard kilometers per hour be planetary travel, for example, or cosmic between-galaxy great transport ship's with speed of Septiliard's LY per one hour. Possibility to develop new transport technologies and outstrip all human values. We create a strong civilization which is based on a robotic civilization and modern science. The development of a strong modern and advanced architecture, android population which is based on artificial Intelligence as a multy supercomputer's. First, our common city were established be cooperation of the today legal government of my country which is abbreviated as The Imperium of Diamond. 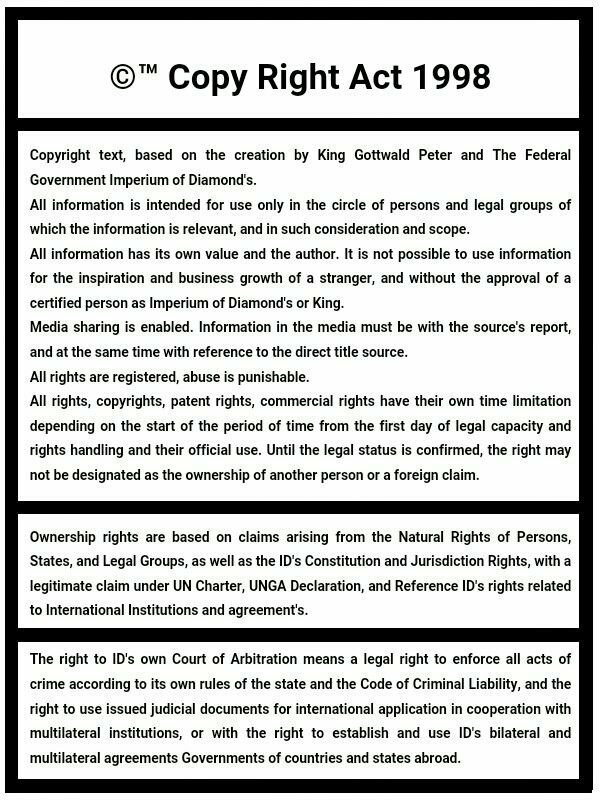 The Imperium of Diamond is a form of political entity that works like a Union or Federation to the governments of countries on our planet Earth and in The Universe. Common area of The Technological City will be created civilization in size, as the first of only 50 x 50 kilometers. Then we will extend this civilization up to over 200 x 200 kilometer. In the same phase, we create a civilization in The Universe, around The Galaxies and supercluster's of The Galaxies. Common Technological Civilization around theoreticaly 15.000.000.000.000.000 planet's. Soon will come for us a new option we can extend our joint city in other ways that are currently not a normal exploitation. Shared Future plans will extend our civilization up to the maritime zones and territories. This town and Research Area below sea level, along the water city and powerful ships afloat. Our cooperation will create a new space and significant opportunities. The opportunity to use the latest technology on the planet Earth and rapidly develop. Subsequent cooperation will use common technology and our strength. Force that will help us to create a new kind of city. Our city under the form of The Orbiting City, a city which is in orbit around our planet. The Orbital Cities, it can be at a height from thousands to ten thousands of miles from the planet Earth. The Orbital City that can be of significant size. Powerful civilization that is developed in The Orbital Ship, The Orbital Station. Consequently, we can extend our common city across my political territories in the federal limit on the entity under the name ,,The Imperium of Diamond's", partialy in ,,The World Diamond", political entity under International Alliance cooperation of All Government's of countries. This is the creation of a new city that will be associated with the government and territory in The Imperium of Diamond or the town which is in The Orbital space or in The Universe. Our together the city will be created in The World Diamond of Europe, it is international territory in which the creation of an International Senate and Parliament. The Senate in which meets every government representative countries around the world. Then your company have a greater opportunity to initiate cooperation on common foreign markets and develop their own trading company in the whole world. The country World Diamond in Europe created our common city which is the first of 10 x 10 kilometers. Then come the development which causes expansion of the city up to 50 x 50 kilometers, maybe more, too in the Universe with mean cooperation of The Imperium of Diamond's. For each position, this use of the possibilities of communication with the city on the other side of the political subject. We can pass between the common center and also to communicate. Today, my plans for the development will allow us to travel and to our Orbital line around planet Earth, next to the foreign Galaxies in the distance of few Doctilion's of Light Year's. Orbit around our planet Earth on which our Orbital City, next Galaxies and Super Cluster's of Galaxies. Common territories in The Imperium of Diamond's. Therefore, we create a production and research zone, laboratories and private sources. Orbital city and other planetary and space center's in Universe, for us to serve as production on the Great Cosmic Civilization ships to travel between the planets and the stars, galaxies and supercluster's of galaxies. Spacecraft that are based on the best technologies and research. According to my information and mathematic calculation, our spacecraft may soon fly at speeds of several Septiliard's Light Year's per only One hour and maybe more. Categoricaly, acording my mathematic and laboratory research, we can create Great Civilizational spacecraft's, which are made from commercial parts, parts of social life, part for fun and recreation or internal tourism, frequently for Science and Research, part of the production and manufacturing technology, supercomputer center's, android center's, factories, laboratories, laboratory mining center's, other parts of the Civilizational ship's, several motor part and consequently often for planting the package which is the foundation of a new civilization on another planet's. Robot development of civilization, autonomous robot's in the package with laboratory for material production and micro factory. This is the opportunity that our will to wait several years. This can be accomplished in 5 years and if we utilized my plans for the full opportunity, then it will be created in 2 to 3 years from the start or create super system for development of Cosmic Great Ship's in time of the Week. Therefore, we have a new and powerful possibilities of use for further progress and development. Our common goal may be to create colonization on some planet in the universe or create an artificial star and artificial system with many by artificial planet's. Artificial planet in the Universe that are produced with the help of laboratories and advanced technology, super reactor's, super form's of large multy dymensional hadron colizer's and supercomputer's for quantum management, with the help of modern science. Scientific horizons that are extended to a much more significant development and way of expanding civilization. We can create a lot of new civilization's, civilization's which are based on many times greater than the size of the planet Earth or our Galaxy Milky Way. Civilization's that are rapidly valuable than the whole planet Earth, civilization based on the infinite resources and mined raw materials and energy or precious materials and industrial needs, organisms or other valuable materials. It is true that we will be able to technologically create a new Galaxy and colonize it. We may utilize a territory which is of infinite size. We may utilize the values that are much larger than a few Kvadriliard €, more and more rapidly. Our cooperation is likely to be, created under the supervision of the political form that is based on international groups of all representatives of countries and governments around the world, our planet Earth, supervisory for safety and stability of legal system. Representatives who may be meet at Universal dominion which the aim is to unite all the nations on planet Earth and in space and therefore territory, therefore too policy of The ED's and The WD. We will work political form for auxiliary development technology and communication with international political group that leads the political sovereignty of humanity in the Universe, The ED's territories, cooperation under development plan and business. As a supplement to the conclusions of the invitation, our common civilization can be extended to other species and the direction of trade or use. It is well in communal center's to create areas like racetracks for Moto GP, Formula One racing or other racing tracks, commercial and recreational zones, hotels that are based on luxury, spa and water wellness centers, libraries, clubs, stadiums and arenas, center for communications briefings large groups, a center for international media and our own television studio, radio and newspaper magazine, common center's create for our cooperation and comunication, living or recreation in free time. I intend to create in a common complex my ,,Royal International University for Science and Research of modern Civilization and High Tech''. The Royal University who is created on the system for The ED's National and International cooperation, Royal University in The Territory of The ED's federal government and therefore too in The Universe. Education about Civilization and modern technologies, special system's of civilizational management, development and dynamic, economy or other intelligence of modern civilization. We therefore people who can contribute to the development of the biggest step in the history of mankind, the biggest step of mankind and the steps that have a rapid greater value than the whole history of mankind since the creation of the planet Earth, we can create value rapidly more pronounced than those values planet Earth since its inception. We can create the greatest achievements of mankind that affects several million in the prior year. Steps and values of our civilization which creates the strongest value of technological intelligence in human history and therefore, together we can extend the value of our corporations which will therefore able to ensure a significant development for your corporations and technological activities in order to market your company, or our common association groups and therefore there is a system when together we can drastically to strengthen the value of all over the world and overtake the technological development in the form of several thousand years. Every one of you who has read this information, You are understood that European governments of countries are now World terrorists. Today, the political rights of European countries are invalid, based on global terrorism. It is terrorism that robs the world and your business company. This project is already many years old, it's maybe 6 to 11 or even more years. Therefore, European governments are indebted country, they must pay us for all the funds he had stolen. Now I get the opportunity to create sovereignty, then this value will be paid by installments and political cooperation for market expansion and economic cooperation. All the stolen or lost value will be paid back to a common name who is our common shares. Share that is partly connected with your business company. So today, your trading company also has all the rights to take legal action to your national court, injunctions against Europe, the demand for an investigation. Now I thank You all for Your understanding and create Your free time to read this letter. I thank You for Your time and future cooperation, our cooperation is dedicated to the future of humanity and our common, much better value. Values who are more important than the planet Earth, the value of which there has never existed. I will thank You very much for the cooperation and create a better future of mankind. At the same time, I ask for Your support and communication with the media, it is well to express Your views to the media and to promote global media that they could communicate. Our cooperation can greatly accelerate our future destination for us to create a stronger value. Dear Busines man's and Companion's, I thank You and wish You a lot of good success in managing your business company. Thank You for Your time and I wish You much happiness and health! All for a better tomorrow. I, Mr. Peter Gottwald please everyone, so that he left from envy and resentment against me. Envy and resentment against the possibility of which I offer to the world and where is my way for global development, be my reall and original values, claim's and ideology. I am a person who is trying to strive to improve the value of the planet Earth and the entire Human World. My effort is to create a common advance for the current position of our humanity and create significant future. My objective is to improve the value of human civilization and begin to create a much better opportunity for each of us to remove many of the world's problems and conflicts. Therefore, I do want to ask You to understand that my success is once again a success for all humankind on planet Earth and the entire human world. Success what this's I wrote in this letter, are the achievements that can give strong support for many companies, create more development of civilization and values, future possibilities. It is a step that strongly support the overall values and world. This is an important step, as significant as many other projects that I offer to us. These are projects that can change the future of humanity, which is significantly changing for a few milion years. Today, therefore, I can say that I am now one of the most significant people on our planet since the formation of the planet Earth and humankind. I am a person who can unite all the nations on the planet Earth and our civilization extend beyond the boundaries of human knowledge. Many steps that make up this world strongly significant and lifting up. Steps that are beneficial for all of us. Therefore, I do want to warn anyone who wants to try to damage my options for on this can be brutal punishment and destruction. He endangered the existence of his country's government and his country, territory and civilization, its values. Therefore, Dear, I ask for Your understanding, I am a person who is trying to envy others, I am a person who is trying to find a common way for mutual success and the just solution. I do not support crime and bad intentions. Today there are many stupid people that are so much stupid that they never talked with my person, they listen only foreign persons which can only publicly to steal, violate the important international laws and rules, mainly to expand lies and get so the most people for terrorist cooperation which does not have a chance for victory. Therefore, I will also back on it, that You understand that Your cooperation with Europe is bad. Bad requiring logic and awareness too from You. Today, many European countries can offer cooperation against me, collaboration, which is why You would rob me and removed, destroyed my options, destroy possibilities for our future cooperation and my today invitation's for development of Your Civilization's, development who is really in all time valuable than all invitation's from European policy, be illegaly or legaly European Invitation's. This is just so they'll lose out on options that I offer to us, possibilities that are from me, and options for which You own the rights if You are fair and will go under the law. If You are not fair and You will not uphold the law, You will support my overthrow of the just my position or claim's, then You lose all rights to loss required options and cooperation. You will be labeled as collaborators on terrorism, then we can come many other countries and the just will take much more value than what today own values throughout all Your land and territory. Then, Your future governments will punish You as a person and they will want to convict You, it is a court convictions and sentences for eliminating those greatest opportunities in the history of Your country and support strategy against the whole of humanity on planet Earth. Me and my right claim's, everything remains unchanged, the future European government be understood by that I am for the best options. I am now officially the best strategy for European governments country, v zájmu jejich nároků na jakoukoliv formu pro jejich budoucí existenci. My governments of the countries I choose as the King and I legally unite European territory. Here in Europe there is no other option. The opposition will be quickly internationaly recognized as a World Terrorism. If You are be European representatives will offer cooperation against me, then it's just an effort to cancel the outstanding sum to Your country, claim's and right's for common future cooperation. Your support for Europe is too suport for World Terrorism. It's much better to listen to him who offers You and for Your country, the best opportunities in the history of Your country. It is not good to listen to those who communicate with You only because that they abused and robbed You and Your National corporation's of the greatest opportunities in the history of all mankind. Europe has had difficulty about anything else, Europe only rob You anymore. This project is dedicated to Your business company. This project gives You the opportunity to develop. Signature declares that a commercial corporation, company, institution, community or legal group has every interest in cooperation for the development of a common project. The project that is described in this letter, The Invitation Card, is an international project in Technological City of Diamond. *Charter is used for registration and use of the possibility to ensure your claim compensation all losses from illegal forms of blocking by the other parties and groups. This document was first drawn up already in 2014. In 2014 I was under the strong insulation from the terrorist movement of the Government Portuguese Republic. Portuguese Government me through hypnosis robbed of the possibility to write letters, communicate to work on intelligent projects and or equally reflected in the interests of society. The Government of Portugal committed a real world terrorism and will therefore be such movement responsibly punishable by means of judicial proceedings and other other means available to be approved by the situation. Therefore, I had to this document to repair and in this case, confirm the legal values and real interests and ability for the development of common plan. document has been changed in the interests of spelling value, specify the expression on relations, values, plans and or political form of activity. document is therefore first truly legal and by the original of interest. terrorist Government Portuguese Republic me illegally abused through hypnosis, so that I could not create original documents according to my actual plans, values, options and ideology. The Government of the Portuguese Republic me terrorist blocked, so that I could not write a original document which will really valuable to achieve full value of cooperation with business corporations, in the interests of statistics view of political competition and values for the threat against your corporation in the area of the value of chance to profit and success. Today, I am in Spain, illegally under the monitoring, not requiring full of the possibility of cooperation with the company, use of normal society, the same time I abused through hypnosis. Today, however, I can use much better opportunities for my own use of my intelligence, knowledge and or forms of freedom. Illegal blocking against my person, by Spain are based on an effort to misinformation and losses my time. Personally, but I can I confirm that this document can be legally recognize and use. Use this document is possible in the interests of social society, between corporations, between the media agencies and news in newspapers, in the radio, in the television. It is legal and impunity if this document free shared with any other person in the world. + Prohlášení o možnosti společné obrany v případě ilegálních blokací ze strany jinývlád zemí : Korporatokracie a národní práva sebeurčení, zároveň i povinnost OSN a UNSC pro spilupráci s námi v zajmu Charty OSN, jasko se subjekty které v tomto případě jsou jediní kdo jsou schopni převzít vedení civilizace a vytvořit vznik svrchovanosti, tak z důvodu teroristické hodnoty současné vlády která nás blokovala a tím ztratila legalitu, současně i proto že my tím získáváme legální nároky které znamenají že jen my jsme schopni udržet existenci civilizace a tak založit naši svrchovanost nad civilizací, protože bez nás taková civilizace zanikne. Proto UNSC musí postupovat podle Charty OSN, tak uznávat naše práva pro svrchovanost a vytvoření nové vlády prostřednictvím UNSC rozhodnutí strategie i rezoluce o hlavním strategickém záměru UNSC. Pikud tak nebude respektováno, UNSC tak vyhlašuje vlastní ztrátu legitimity pro globální bezpečnostní záležitosti politiky a pravomoci, práva UNSC jsou převzaty skupinou UNGA. + Naše území, každý zástupce korporace se stává Senátorem vlády. Společným systémem budeme fungovat jako jeden významný subjekt politiky v podobě vlády země.